SC 349 served in the Otranto Barrage, Lt.(jg) W.A. Martin, USN, commander. In the same unit were SC 255 and SC 256. 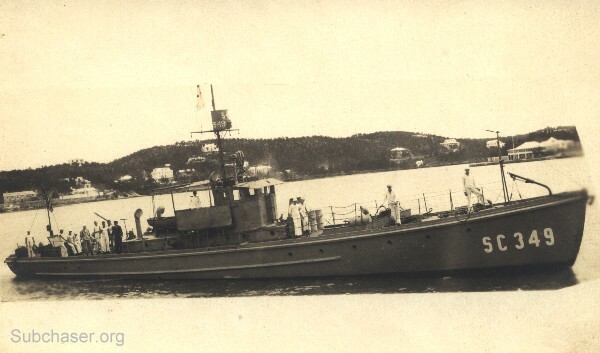 Photograph of submarine chaser SC 349. T. Woofenden Collection. Dr. Edward Harris of the Bermuda Maritime Museum indicates that this photo was taken in Hamilton Harbor, Bermuda, with Paget Parish in the background left and White's Island background right.